What goes together better than the Internet and food? But there’s more to this delicious combination than just posting photos of last night’s meal on Instagram. Continuing our theme around the “Internet of Things,” we present another possibility from this game-changing technology. This time, it is a use case on IoT for inventory management. 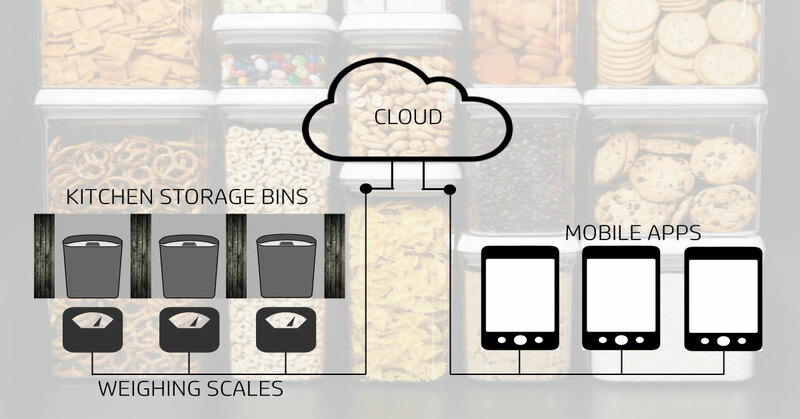 In this blog post, we’re going to use IBM Bluemix and PubNub to build an application that will transform any dumb kitchen by enabling automatic inventory tracking. You’ll never run out of bacon again! Note: This post was originally published in IBM Bluemix Blog. Mobile app: Provides an easy interface to see the current state of inventory and also offers analytics to view inventory history for the last seven days. Communication between the components of this application is handled by PubNub’s real-time Data Stream Network. The hardware is powered by a combination of Arduino UNO and Mediatek Linkit ONE. For sensing the weight of kitchen storage containers, two piezoelectric load cells are used. In order to produce the desired strain for determining the container’s weight, the load cell needs to be mounted between two flat surfaces (such as plywood) with the help of the two threaded holes on each side of it. Once mounted, the flat surface can act as a scale for measuring the weight of a storage container. Analytics – Access historical inventory usage data for better prediction and planning. Now it’s time to discuss the detailed hardware, software setup and the complete functionality of this inventory management system. If you would like to build this application yourself, then you can access the complete source code on GitHub. All the steps for setting up and building the project’s components are listed in the README file. Before building, you need to sign up with IBM Bluemix and PubNub. Visit the Bluemix registration page and PubNub service page to create your respective accounts. Both services offer a free tier account to play around with their offerings. The Inventory Tracking Server (ITS) is written in Python and can be installed as an IBM Bluemix hosted app. IBM Bluemix provides the computing horsepower for the ITS to monitor hardware devices and manages automatic inventory tracking. Additionally, you will need to associate the PubNub service with your Bluemix account for the ITS to work with PubNub. Refer to these deployment steps to understand how to setup and host a Python application under Bluemix with PubNub. As noted earlier, the source code for ITS is located under the kitchen_tracker directory in the GitHub repository. Sensor Controller – Driven by Arduino UNO, the sensor controller acts as a localized aggregator of all storage containers which are under this inventory tracking system. It interfaces with the load cells to sense their weight and is connected to an HM-10 BLE module to transmit the weight data over Bluetooth. By using this arrangement of local aggregation and BLE, there is an added advantage of bringing in new storage containers under this inventory tracking system with the minimal additional wiring. Master Controller – Master controller acts as a gateway for the sensor controller. This is powered by Linkit ONE board. It has an inbuilt BLE module that probes the sensor controller every few seconds to get the current weight sensed by the load cells. It also has inbuilt WiFI interface for connecting with ITS over the internet to send the weight readings. The master controller plays a crucial role in stabilizing the weight value of the containers. This is to avoid sending transient or spurious weight values while, for example, the container is being refilled gradually. Refer to these build and install steps for configuring the hardware. The source code for hardware setup is available under the hardware directory (for the sensor controller) and the linkitble/pubnub_linkit directory (for the master controller), under the GitHub repository. Calibrate the load cells to avoid errors is weight measurement. Look at all that bacon! The source code for the mobile app is under the mobileApp/kitchen directory in the GitHub repository. Steps for building the app are available here. Python SDK, (Version 3.x) for ITS. PubNub REST API, for Linkin ONE Board. PubNub uses the ubiquitous publish/subscribe mechanism to stream data in real-time, from one device to another. This is achieved by the use of channels which provide a secure bidirectional messaging layer between the devices. This application uses several PubNub channels for enabling communication between the hardware, ITS and mobile app. Refer to this tutorial to learn more about how to build a small publish/subscribe demo using PubNub. Label – A user-defined identifier for the container for easy identification. Threshold Value – A threshold value (in kilograms) to indicate a critical level for container weight. Expiry – Since most of the kitchen inventory is consumable food items which have an expiry date, we can set an expiration value (in months) for the container. This way, the server can track the expiration date and send a notification to the app when those contents have expired. These parameters can be set for every container. Once submitted, these settings are sent to the ITS application server via a PubNub channel. Step 2: ITS receives the new weight and daily consumption for the current day. Step 3: ITS updates the database to record the daily consumption data. Step 5: The app receives the new weight value and updates the screen display to reflect the new weight value and updates the visual level indicator for the container. Step 2a : ITS resets the expiry calculation to start from the current date. Step 2b : ITS stores the start of expiry date in its internal memory. Step 2c : Use case continues from step 3. This use case is also an alternative flow of the previous use case. If a container has not been refilled before the expiry date, then the ITS can sense this during step 2 and alert the user whenever it detects a consumption to warn against expired food. Step 2a: ITS receives the new weight and calculates the expiry validity of the container and finds that the expiry period has been crossed. Step 2b: ITS updates the database to record of the daily consumption data. Step 2c: ITS publishes the new weight on PubNub channel kitchenApp-resp and sets the expiry parameter as zero. Step 2d: Use case jumps to step 5. When the mobile app receives the notification for consumption with the expiry set to zero, it updates the container icon in a way to alert the user that the inventory being consumed has expired. The ITS is supported by a backend data warehousing service powered by IBM DashDB. Daily inventory data for consumption and replenishment is updated on dashDB database which can provide some basic analytics on historical inventory usage for the last 7 days. To display the historical inventory usage, the user has the option to either display a graph or a table by tapping on the “Graph” or “History” button. This application demonstrates how easily one can leverage IoT to eliminate human intervention and automate manual processes. For a restaurant or large hotel, this can make a big difference. A further enhancement of this app would be to automatically place an order with suppliers when inventory falls below a critical level. The possibilities are endless, and with IBM Bluemix’s state of the art data warehousing and the 99.999% reliable messaging infrastructure of PubNub, building such solutions is fast, secure, and highly scalable. Stay tuned for more demos and application use cases using IBM Bluemix & PubNub Data Stream Network!